Public Trust finished its three-week run in Copley Square, September 11-17, 2016. Close to 400 people made promises, surrounded by monuments to learning, faith, and commerce. Every promise was a profound reminder of the power of our words in a time when words really do matter. Public Trust moved to its second location in Kendall Center, September 3-10, 2016. Almost 300 promises were made by visitors around the globe. Here's a small sampling of the imagination and friendship we experienced in Kendall. Public Trust, launched in Dudley Square, Roxbury, MA on August 27, 2016, made over 300 Bostonians' promises public. This small sampling of the thoughts and images shared during its seven-day run in Dudley illustrates the bold and heartfelt promises given and a timely conversation. What went into making each promise at Public Trust? A promise is a labor of thought, love, intention, and--at Public Trust--conversation. And then there was the 16' x 16' billboard where each promise was displayed alongside the day's headlines, and the tables each participant sat at to create their promise. Many people coming to make promises at Public Trust have found out through local media. "I heard about this on NPR!" For your reading and viewing pleasure, here's a roundup of some of the press coverage of Public Trust throughout Greater Boston. 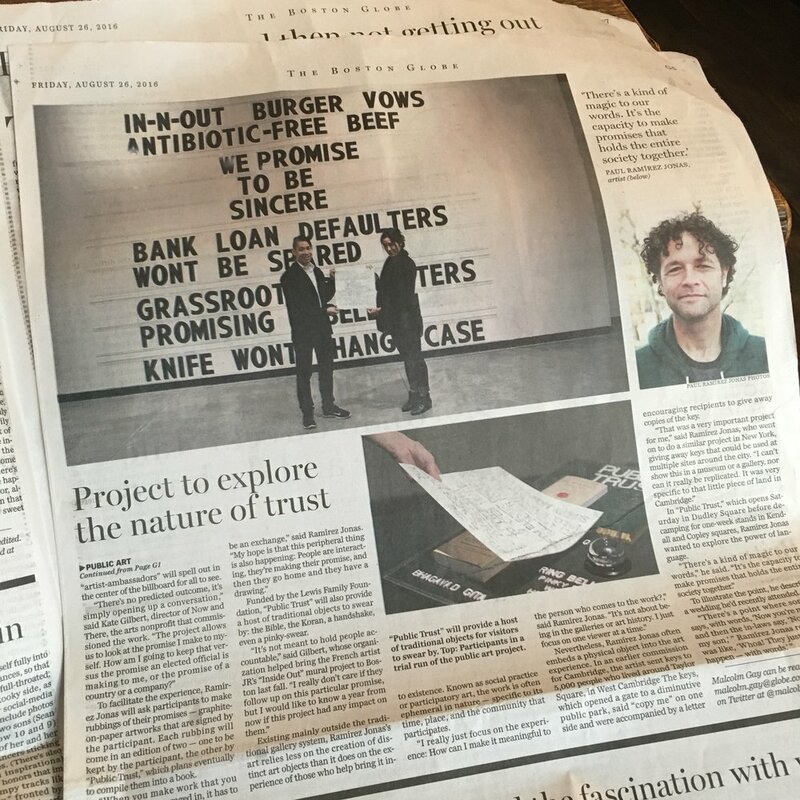 Guest blog post by artist Paul Ramirez Jonas explaining the experience of Public Trust, from first encounter to making a promise public. Paul Ramirez Jonas and Kate Gilbert joined Jared Bowen and Margery Egan of Boston Public Radio to discuss the evolution of Public Trust. In five days over 200 Bostonians have sat down to talk with Paul Ramirez Jonas or one of our ambassadors to share a promise, create a drawing, and then publish it on the billboard in Dudley Square. Check out every picture here. Arts Reporter Malcolm Gay asks, "Is your word really your bond?" in the August 26, 2016 edition of The Boston Globe. Meet the Public Trust Artist Ambassadors! Meet the thirteen Public Trust Artist Ambassadors working with Paul Ramirez Jonas to help us make promises to ourselves and our communities and reflect on the power of our words. Do you want to see more public art in Boston--and all the good that comes of it--like we do? Then please consider a tax-deductible donation in any amount to support our upcoming project, PUBLIC TRUST with Paul Ramirez Jonas, and future projects. To bring more public art projects like PUBLIC TRUST to Greater Boston, Now + There is asking you to make another kind of promise, a pledge of your financial support. Donate an amount that is meaningful to you via our secure site, receive our undying love, AND get some great swag showing you helped build Public Trust. We appreciate any and all support and will recognize your promise kept on the Public Trust website! When is Public Trust Happening? Public Trust will happen in three locations in Greater Boston August 27 – September 17. Check here for exact locations and hours. June 14 was the first test build of the big data board. (It's 16'x16'x8' to be precise.) Shout out to C.J. Stasinos and the gang at Pro Event Staging for letting us take over their parking lot! On June 13 N+T supporters got a sneak peek of Public Trust and a chance to preview the work with Paul before it goes into the public. With their generous support, we were able to raise funds to ensure the performers leading Public Trust will be compensated at well above the living wage. Something this big deserved a little R&D, and thus, Public Trust was tested this past winter by Ramirez Jonas during his residency at Grand Central Art Center in Santa Ana, California. Over two Saturdays during the Santa Ana Art Walks, Paul performed the work and tweaked the process each time. The final performance was led by an actor and became the basis for a script that a team of Boston-area performers will follow during Public Trust's 21-day run. Working with CSUF alum Robert Huskey (BA, Visual Communications ’14), GCAC created a lovely video documenting the process of Public Trust during their February opening. Our sincere thanks goes out to John D. Spiak and the entire GCAC team for helping develop Public Trust. In 2015, the Lewis Family Foundation expanded its philanthropy into Boston's public art arena through the anonymous support of Now + There. Their support helped us establish firm roots and helped fund our first collaboration, "Faces of Dudley." Now, we are thrilled to announce that The Lewis Family Foundation is provided full funding for Paul Ramirez Jonas’ Public Trust. With their generous support, we are able to bring this timely project about promises to three Greater Boston locations and provide the opportunity to use art to give voice. The Lewis Family Foundation seeks to empower young people, develop courageous citizens and leaders, level the playing field for educational and job opportunities, and create strong strategic alliances. The Lewis Family Foundation believes that our communities grow stronger through artistic expression. During an invitational interview one unseasonably warm day in the spring of 2015, Paul Ramirez Jonas cycled through the streets of Greater Boston and astutely noted the lack of places for civic dialogue and asked, "Where does everyone in Boston congregate?" Little did we know then that he was developing the kernel of an idea that has become Public Trust, a project that allows the public to make a promise in the context of other promissory statements made by politicians, scientists, community groups, and even countries—and to do so in very visible way. Over the course of the past year, we've watched Paul develop and workshop this conceit that we, everyday people, can make things with our words; things like contracts and trust. When Paul is not cycling in Boston he can be found in his Brooklyn studio preparing for his upcoming 25-year survey at The Contemporary Art Museum Houston, teaching at Hunter College and watching his daughter grow up too quickly. Learn more about Paul here or watch his October 2016 artist talk. Now + There is pleased to announce our first commissioned project with the world-renowned artist Paul Ramrez Jonas. Over the past year, N+T has worked with Ramirez Jonas to develop an interactive public art project made specifically for Greater Boston that documents and contrasts participants' promises with those promises that appear in society at large. Public Trust will occur in three locations throughout Greater Boston and will employ local performers to activate the work. This socially engaged art draws on Ramirez Jonas' long history of engaging the public to complete the work. For more on his practice view his October 2016 artist talk with N+T and partner MassART. Public Trust opens August 27 and closes September 17, 2016. Visit www.publictrustboston.com for updates.